Another Detroit Auto Show is upon us, and you know what that means: it’s time for you, the readers, to test your mettle against the driving gods of Jalopnik. Are you faster than we are? (Probably.) Come find out this weekend! 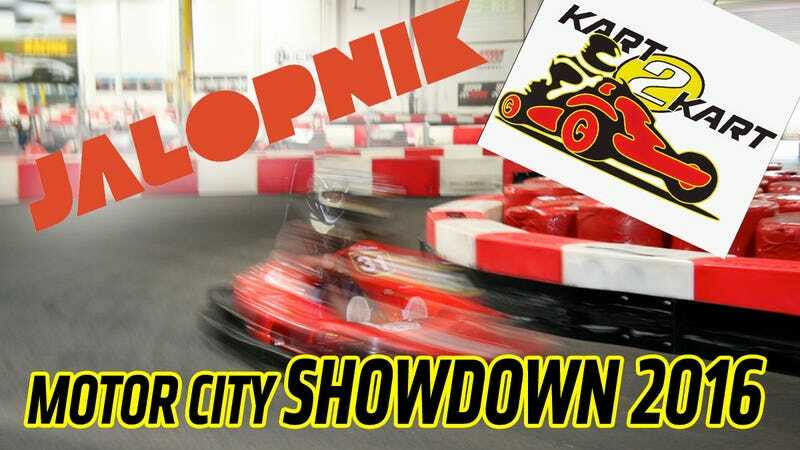 Our friends at Kart 2 Kart in Sterling Heights are once again kind enough to host a night of racing action for all friends of Jalopnik who happen to be in the greater Detroit metro area. And once again, it’s a mini-grand prix format and two qualifying sessions for all drivers, followed by a single trophy dash with the top 10 drivers. If you emerge the fastest driver, you will be crowned Speed King (or Queen) Of Detroit. And history will remember your name. Oh, and there’s pizza! Kart 2 Kart will be generously providing some light fare with your admission price and Jalopnik will provide free soda to anyone who signs up. This year the lineup on our end includes myself, Ballaban, Orlove, David Tracy, Roselli and Auslander, plus any ringers I can deputize at the last minute as “writers” so we don’t lose too badly to the readers. Again. The cost is $49 per person to enter, but that’s a steal considering you get two qualifying sessions, a shot at the title if you’re fast enough, plus food and drinks on us and Kart 2 Kart. But wait, there’s more! This year we’re trying to have a live Q&A, so if you have any questions you want to ask us, now is your chance. Please call in advance 586.997.8800 or email brad@kart2kart.com to PRE-REGISTER, as they may run out of slots and could use an idea of who’s coming. Pizza: 7:45 - 8 p.m.
Trophy Dash: 10:30 p.m. - 1045 p.m.
You should come, it’s gonna be great!